I’m a 25-year old female illustrator from Denmark and I want to create an inspirational blog that will feature a lot of the fun and creative stuff I come across every day. If you want to read about my own work and adventures then go visit my personal blog Je suis Honey. My favorite word is POULET and means chicken in French hence the blog name. Poulet Poulet is also the name of my website and design company. Feel free to visit my portfolio if you want to see more of my work. 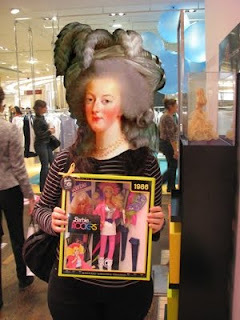 Me in Paris with retro 80s Barbie. And no, that’s not my real head haha.